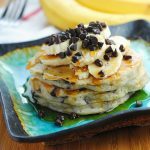 These banana chocolate chip vegan pancakes are made with almond milk, chia seeds and coconut oil! Healthy and delicious. In a small bowl, mix the ground chia seeds with 3 tbsp of water. This is a chia-egg. Let it sit for about 1 minute. In a large mixing bowl, combine the flour, sugar, baking powder and baking soda and stir. Add the almond milk, coconut oil and chia-egg mixture and stir until incorporated. Add the mashed banana and chocolate chips and stir until evenly mixed. Heat a well oiled pan or griddle to medium-high. Scoop ¼ cup of pancake batter and pour it on to the hot pan. Let it cook until it starts to bubble on top and feels firm on the sides (about 2-3 minutes). Flip each pancake over and let cook for an additional 2 minutes. Remove from heat and serve with banana slices, chocolate chips and real maple syrup. Get this recipe for Banana Chocolate Chip Vegan Pancakes by The Blenderist at https://www.theworktop.com/guest-posts/vegan-pancakes-the-blenderist/.